He’s not from Scooby Doo! He’s Real! Shaggy Flores founded the Invisible Order of The Chancleta in order to overthrow the Imperialist Empire of Gringolandia. With your help and a contribution of $1,995.00 you can make his dreams come true. Tell folks you have a Latino friend, Book Shaggy Flores today! Still need more peer pressure? Here are some good folks who can testify to his mind control abilities! For this Nuyorican poet with roots in Cupey – Puerto Rico,Spanish Harlem and Springfield – MA, reciting about his views on Corporate America, Racism, African Diaspora culture, Stereotypes or Identity issues was and still is more than just poetry. It is a way of educating and empowering Puerto Rican young people to become future leaders and help bring change in their communities. It is a way of life! 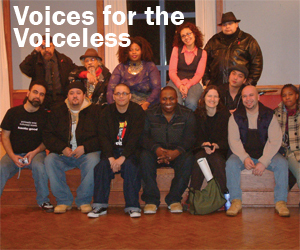 Several said that the difference in Flores’ approach was that he taught them about poetry in connection with their Black, Puerto Rican, Latino heritage, ancestors, and history. He encouraged youth to write from their own unique cultural perspective and to be proud of their roots. This encouragement helped many of the participants find their voices as poets. He performed for us in our gym some time ago for our students and we were all inspired by the power of his work and his dedication to the community. From the minute he started, all the students were focused on his message of cultural beauty and history. This Brother is no joke! Need more Convincing? Click here to participate in a mind control experiment.